It’s much better living in a polite society than one that is not! Haha! I encounter similar situations in the Canadian north just trying to cross the street. Of all the “negative” stereotypes, I have to agree that excessive politeness is one of the better ones to have! Perfect! And definitely not negative. What a great reputation to have! 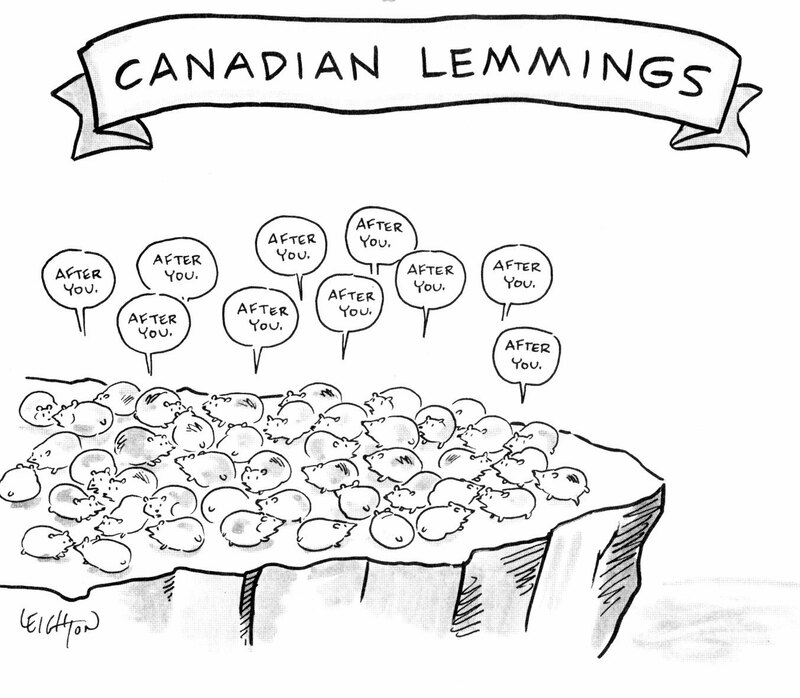 Cute cartoon and a definite compliment to Canadians! If we could claim being Canadian with any chance of success — we would! Polite is GOOD, in my book. Too funny, just like saying I’m sorry a lot… tee hee. haha! I think it’s more noticeable in the east. When New Yorkers and Bostonians who go north of the border it’s a different world! Out west here it feels more the same when you go north of the border. Hi Brett: May I use the cartoon for future use. I will ensure that it’s link back to you as a source. Thanks. Perpetua. Perpetua, yes, please feel free to do so. Canadian politeness is known World-wide. It’s good to be known for that and not the idiocy the UK is becoming known for. I’d rather have your take on things. After you. Politeness is lovely. It helps keep day to day interactions a pleasant thing butI guess like all things in life, balance is the key. Better overly polite than overly rude, though! Thanks for liking my post about Alice Munro. I am a big fan of things Canadian, starting with Ian and Sylvia and Gordon Lightfoot and going through their distinctive personalities. Have to say, though, I’m not a hockey fan, and I don’t care for poutine. But I love their flag and way of speaking. Thanks for an insightful and amusing blog! Thanks so much for visiting my blog and “liking” my drawing “A Tangle.”T he art and photography on your blog is very beautiful. Thanks. Your drawings are also wonderful! Thanks. Your drawings are also wonderful — love the creativity! The politeness is a bit of a double-edged sword though. It also entails the expectation of politeness from each other. Thus, if the expected overly-polite etiquette is not forthcoming, Canadians can grow rather wroth with one another rather rapidly. That makes sense, but I appreciate hearing it, especially with the word “wroth” thrown in! You’ll see what I mean by “wroth” if you experience it. There is no more modern English word that can better encapsulate the reaction. As a Canadian, I experience wroth regularly precisely for the reason outlined by Deconquestubritanniae: there is an expectation of reciprocity. All too often our politeness backfires and we become resentful because people aren’t polite in return. Or, even worse, if they are taken advantage of. Oh my! If you ever get a Canadian cornered, a bit drunk, and then ask politely, they may spew forth their woes on the topic. The whole undercurrent of anger is quite ironic and a bit tragic. I try to laugh, but inside I quake. Sad, but true. Thanks for visiting my site, Brett. I greatly appreciate the fly-by. I look forward to reading more from you! Yvonne, I get that — putting aside cultural baggage, we’re all just people and share similar feelings and emotions. Stereotypes have some basis but you’re spot on in my book. I love your blog! It has given me a great insight into Canadian culture and behaviour ! I really appreciate the courtesy of Canadians… I know it can seem like it’s not all that important, but it really makes a difference in the live-ability of a place. cheers! Completely agree! We should all treat one another with common respect. it makes life much more pleasant !! Keep being your polite self — it’s a good thing! I agree with you about how friendly the people are up there. I was a long haul truck driver most all of my adult life up until last June when I had to quit working. In my work duties I went to Canada probably about 30 times going all over their country. I have told my wife that if it wasn’t for the cold weather (which we both hate) that Canada is a great place to live, friendly, clean, and extremely low crime rates. I do wish Americans were as polite. We would all be less miserable, and therefore more polite! No one ever cartoons that New Yorkers are too polite…! Head to Toronto. Politeness goes out the window. This is so true! No wonder when I was at an American event yesterday, they knew I would step out of the way! Thanks for ‘liking’ my blog Tim’s Cover Story. As someone who grew up on the border (Niagara Falls, NY), I appreciate your comments about Canada & Canadians. David from the UK – Love Canada & Canadians and how politely and patiently taught me to play Crokinole so they could smash me into the ground every time : Here is my favourite FAQ from the Mr. Crokinole web site: http://www.crokinole.com/faq.asp – and they really mean it! Why does it hurt my finger when I shoot a disc ? Good question! The answer is simple. If you live in a society that understands hockey or soccer, picture the slap shot (hockey) as opposed to the wrist shot, or the grand swing kick (soccer) compared to a well-aimed toe kick. The secret of an accurate, pain-free shot is to move your finger up as close to the disc as possible. Don’t hit it. Push it!!! Get that finger up really close. Take aim and shoot. Pain will not be a factor, even-as some believe-if you hit the post with your disc. Get your fingernail right on the disc. You will have more accurate shots and no pain. Now there’s a lesson for life.